Duck Dynasty’s Mia Robertson is slowly recovering after she underwent another surgery on Friday, March 27, to repair her cleft palate and lip. Mia’s mom, Missy Robertson, wrote on her Facebook page: “Mia’s recovery has been slow and painful, but today has been a good day. Cousin Bella brought her a snow cone and that seemed to do the trick. Thank you for your continued prayers and support. She still has a tough road ahead, but we can see a glimpse of light that has been hiding for the past 5 days. She is definitely a brave kid! This is a video of her hospital room. Each paper doll was made by a child from either our WFR church or our OCS school family and have a scripture or a message telling Mia to “Be Brave and Keep Going”. Over 500! What a blessing to this mom to know so many kids (and adults) love and are praying for my child! 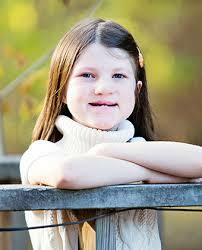 Mia Elaine Robertson, 11, was born with a bilateral cleft lip and palate.